Do Hypoallergenic Cats Help Cat Allergies? Sphynx cats produce fewer allergens than most cats and may be better pets for people with cat allergies. If you can stop sneezing long enough to read this sentence, take heart: Certain cat breeds are easier on your allergies. There may not be any true hypoallergenic cats, but there are cats who produce fewer allergens than most. Understanding cat allergies can help you trigger them less. People aren't allergic to cat hair, at least not per se. Cats produce a protein in their dander, saliva and urine that makes most people with cat allergies sneeze, tear up, get itchy and have difficulty breathing. Cats shed allergen-coated skin flakes and coat their fur with allergens when they groom themselves. These allergens have staying power. They can cause allergic reactions months after the cat in question has left. People with slight to medium allergies tolerate some cat breeds better than others, leading some to believe those cats produce fewer allergens. You might think exposure to small amounts of allergens helps you develop a tolerance to them. Some anecdotal evidence supports this approach, but it defies the conventional scientific wisdom about allergies. If you've got cat allergies but you refuse to give up on finding a feline companion, you're probably looking for a hypoallergenic cat. Unfortunately there's no such thing -- at least not confirmed by science. There are however, breeds that seem to produce fewer allergens or shed less allergen-coated hair than others. They may be less likely to trigger your allergies. Some people say Siberian cats are easier on people's allergies. Their longer hair may pose cumulative problems, though, as it and accompanying allergens cling to furniture. Balinese, Javanese and Oriental shorthairs are similarly thought to be easier on people's allergies. 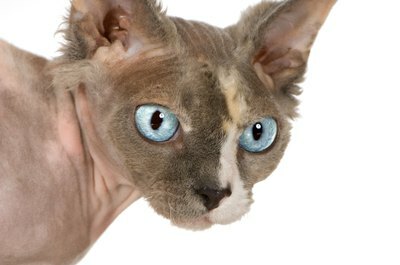 Devon rex and Cornish rex cats have very short coats, and Sphynxes have thin, mossy fur that makes them look naked. These breeds shed less than their feline compatriots, thus leaving behind fewer allergen-coated hairs. None of these cats is truly hypoallergenic though, and not all people with cat allergies do well with them. If you're adopting a cat despite your cat allergies, make sure you have a backup plan if things don't work out. It also helps to consider a few other cat allergen facts. If you've got cat allergies, a light-colored female cat may be your best bet. Some companies and breeders claim to have engineered hypoallergenic cats -- Allerca infamously announced one such creation in 2006 -- but scientists have yet to verify such claims. These designer cats often carry hefty price tags. If you're one of the 6 million to 10 millions Americans allergic to cats or other pets, you've got to make some tough choices about keeping cats. Regardless of the cat you chose, it helps to stay on top of cleaning. Vacuum and use lint roller frequently. Remove carpeting, which is essentially a giant fur trap. An air filter can help, too. Wash cat toys and bedding regularly to stop allergen accumulation. Wear more cotton and less wool. Swap out heavy drapes. Most cats don't like weekly or bi-weekly baths, but you can usually get away with wiping them down with a wet towel. Weekly or bi-weekly brushing helps control shedding. Foremost, you need to wash your hands and face after contact with the cat or allergens. Cat World: Hypoallergenic Cats -- Do They Exisit? PetBehaviorProblems.com: Which Pet is Best for Your Lifestyle? How Can We Avoid Cat Allergies When Visiting Friends With Cats? What Are Some Hypoallergenic Dogs & Cats?